Epic scenery, diversity of cultures, stunning wild life, colonial cities and unlimited space. Namibia, located between the Kalahari and the South Atlantic is famous for its stark beauty. It makes you question whether something so visually beautiful could actually exist. Time and space are less defined and landscapes of rugged mountains, lonely deserts, and dramatic seascapes collide. It is an example of conservation with some of the world’s grandest national parks and a naturalist and geologist’s paradise. Spread throughout Namibia on an amazing scale, game parks and nature reserves constitute some 18% percent of the country available surface area. Some, like the huge Etosha National Park, focus primarily on wildlife, while others like the Namib-Naukluft Park and Fish River Canyon are more landscape oriented, their natural beauty easily upstaging the game. The Namib Desert and coastal plains in the west, the eastward sloping Central Plateau, the Kalahari along the borders with Botswana and South Africa and the densely wooded bush of the Kavango and Caprivi region. Namibia is a safe and easy country to travel in, although beware of its distances. It is also one of the most sparsely populated countries in the world. Just over 2 million people inhabit an area the size of Texas and Oklahoma combined. If you wish to combine seeing the northern with southern areas you might like to combine flying with overlanding to get the best out of it. It really depends on where you want to go. Fortunately, most of the country enjoys more than 300 days of sunshine a year. So there’s not really a bad time of year to visit except perhaps around the summer season when it’s quite hot —from November through March—or during the main rainy season —from January to April. From March to October, some regions are humid but generally you can expect clear, warm sunny days and cold, clear nights that often fall below freezing. Game viewing in Etosha and Ongava is best during the dry season May to November with game viewing in desert areas good year round. Etosha, “The Great White Place” is one of Southern Africa’s most popular wildlife parks and caters to all kinds of safari lovers. The concentration of big game around the waterholes makes game viewing incredibly rewarding. In fact, you won’t have to leave the rest camp to see lion, elephant, rhino and any number of antelope and zebra quenching their thirst. 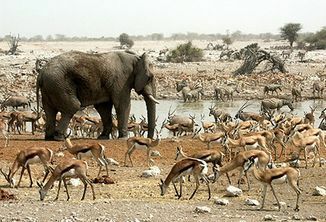 The vegetation is mostly mixed scrub, mopane savannah and dry woodland surrounding the huge Etosha Salt Pan, a shimmering white and dry depression except in the rainy season. Etosha is famous for huge elephant population best seen during July to September with large numbers also around during, May, June and October. Lion sightings are common and zebras are abundant. Black rhino, leopard, wildebeest, there is no shortage of game. 340 species of birds have been recorded. Ongava Game Reserve is located on the southern boundary of Etosha where night drives and walks are allowed since it is privately owned. When staying at Ongava you have the option of morning drives in Etosha and afternoon walks and night drives on the private reserve. It is also a rhino breeding center with both black and white rhinos as well as high concentrations of a variety of game. The Namib-Naukluft National Park encompasses part of the Namib Desert, considered the world’s oldest desert, and the Naukluft mountain range. It is the largest game park in Africa (the size of Switzerland) and the 4th largest in the world. A surprising collection of creatures survives in this hyper-arid region, including snakes, geckos, unusual insects, hyenas, gemsboks and jackals. It also provides a sanctuary for black rhinos, Hartmanns mountain zebra, leopard and cheetah, although not in great concentrations. Sandwich Harbour is home to up to 50,000 wetland birds including spectacular flocks of Greater and Lesser flamingos. Iconic towering dunes, shimmering pans and an endless sea of sand, this is Sossusvlei. The clear blue skies contrast with the giant red sand dunes to make this one of the natural wonders of Africa and a photographers heaven. Sossusvlei means “the gathering place of water” though seldom will you find water here. Instead you’ll find the highest sand dunes in the world in places riding to more than 900 feet above the desert floor, and perhaps Namibia’s most outstanding scenic attraction. These dunes, part of the Namib Desert, have developed over a period of many millions of years. The result of material flowing from the Orange River dumped into the Atlantic Ocean, carried northward and then returned again to land by the surf. Here the wind continuously shifts the sand further and further inland, reshaping patters in warm tints that contrast vividly with the dazzling white surface of the large deflationary clay pans at their bases. The orange color develops over time as iron in the sand is oxidized, like rusty metal; the older the dune, the brighter the color. Climbing up one of these dunes provides breathtaking views of the whole area, including Deadvlei, a large ghostly expanse of dried white clay punctuated by skeletons of ancient camelthorn trees, carbon dated between 500-600 years old. The dunes taper off near the coast, and lagoons, wetlands, and mudflats are located along the shore. More moisture comes in as a fog off the Atlantic Ocean than falls as rain, with the average 106 millimeters of rainfall per year concentrated in the months of February and April. The belief that nothing could survive in temperatures that surpass 104ºF during the day and fall to below freezing at night is a real one. Water is scarce but life still manages to exist under the sand. Tiny tracks at the base of Sossusvlei’s dunes give the game away. A fine example is the toktokkie beetle, one of over 200 species of tenebrionid living in the Namib Desert. Whilst under the surface they communicate between sexes by tapping their abdomens on the ground. The shovel-snouted lizard is another sub-sand survivor, a reptile that has the ability to store water in its body. Other desert-dwelling creatures drink droplets of the desert’s periodic fog or lick minute tear-drops of water trickling down rocks and plants. Others simply burrow a channel in the sand, an action that will allow them to accumulate moisture such as Grant’s golden mole. This amazing little rodent spends almost its entire life under the sand and as a result of this evolutionary adaptation, has no need for eyes. Visitors are allowed access to Sossusvlei only between sunrise and sunset. 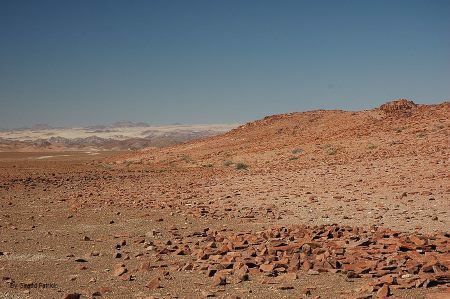 The first 37 miles of the road from Sesriem to Sossusvlei has a permanent surface and is suitable for sedan cars, whereas the last 3-mile stretch of sandy track is negotiable by 4×4 vehicles only. The closer you stay at the park entrance the earlier you will be at the dunes during sunrise. Aside from the attractions at Sossusvlei – Dune 45, Hiddenvlei, Big Daddy and Deadvlei – other attractions in the area include the Sesriem Canyon and Namib-Naukluft National Park. The Skeleton Coast Park remains one of the world’s last great wildernesses: harsh, still not completely explored, definitely untamed and extraordinarily beautiful. Known by the Bushmen as the “Land God Made in Anger” the Skeleton Coast is remoteness at its best. Thousands of miles of sandy desert dotted with shipwrecks meet with the cold waters on the Atlantic and somehow an amazing array of wildlife and flora manages to survive in this harsh but beautiful environment. Proclaimed in its present form in 1971, the park extends from the Ugab River in the south for 311 miles to the Kunene River in the north, covering an area of 6,503 square miles. It protects about one third of Namibia’s coastline. The landscape in the park ranges from sweeping vistas of windswept dunes to rugged canyons with walls of richly colored volcanic rock and extensive mountain ranges. The climatic conditions are not necessarily what you would expect in a desert country like Namibia – dense fog and cold sea breezes – and this is caused by the cold Benguela current which flows offshore, meeting with the extreme heat of the Namib Desert. The Skeleton Coast is often associated with famous shipwrecks, and stories abound of sailors walking for hundreds of miles through this barren Namibian landscape in search of food and water. The name came from the bones that lined the beaches from whaling operations and seal hunts, but more than a few of the skeletons were human. The Bushmen called it The Land God Made in Anger and the Portuguese knew it as The Gates of Hell. Ever since European navigators first discovered it, ships have wrecked on its off-shore rocks, or run aground in the blinding fog. While small boats could land, the strong surf made it impossible to launch, hence the stories of sailors walking through the murderous terrain. Animals occurring on the plains are gemsbok, springbok, jackal, ostrich and brown hyena, while desert-adapted elephant and even black rhino, lion and giraffe roam up and down the dry river courses. Of special interest are the clay castles of the Hoarusib, the salt pans near the Agate Mountain and the seal colony at Cape Frio. A Skeleton Coast Fly-In safari or hot air balloon over Sossusvlei are the highlights of any trip to Namibia. Huge, untamed and ruggedly beautiful Damaraland is an exceptionally scenic landscape of open plains and spectacular rock formations. The northwest of Namibia is its best-kept secret. While visitors flock to the coastal town of Swakopmund, the dunes of Sossusvlei or the salt pans of Etosha National Park, the Kunene region is mostly free of people, especially tourists. Only a few thousand Himba live in a mind-boggling landscape of 100 000 square kilometers. If you are looking for silence, solitude & impossibly beautiful scenery, then this is it! The landscape tough is as impressive as it is intimidating. Rugged mountains in the eastern escarpment spread out into massive valleys and plains, before the beginning of the Skeleton Coast in the west, where endless dunes lie adjacent to the cold Atlantic Ocean. This is wild land, where you can drive for two days and not see another car, and where you feel very subordinate to the grandeur of nature. If you’re searching for your soul, then come find it here. 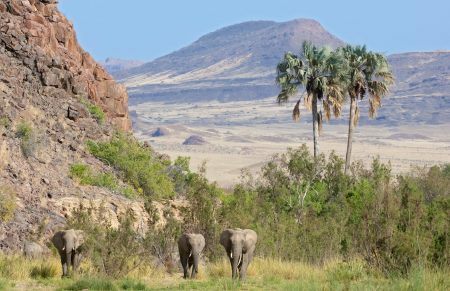 Despite the aridity and foreboding topography, the Kunene region – comprising Damaraland in the south and Kaokoland in the north – is now becoming one of the most accessible, authentic wildlife destinations in Africa. Visitors can reliably see desert-adapted elephants, black rhino, lions, Hartmanns Zebra, giraffe and gemsbok. Other wildlife areas of Africa may offer more numbers of animals, but Namibia’s northwest is the most biodiverse desert on earth. Here you will see Africa’s animals on a massive canvas of rock, sand and dust. The Brandberg – Namibia’s highest mountain and home to the famous ‘White Lady’ Bushman Painting. Twyfelfontein – a wonderful rocky outcrop with thousands of Bushman engravings and a nUNESCO World Heritage Site. The Vingerklip (finger rock) – a towering finger of limestone that rises 100 feet above its base. With 16,000 or so inhabitants, 5,000 of them Himba, Kaokoland has a population density of only one person to every .7 square mile which is about a quarter of the national average. The Himba, a tall, slender and statuesque people, rub their bodies with red ochre and fat to protect their skins against the climate. In terms of wildlife Kaokoland is probably most famous for it’s desert elephant. The possibility of obtaining a glimpse, however brief, of a herd of desert dwelling elephants is what draws most tourists to the area. They have special behavioral characteristics, large annual and seasonal ranges and a social structure and daily activities to cope with the environment. 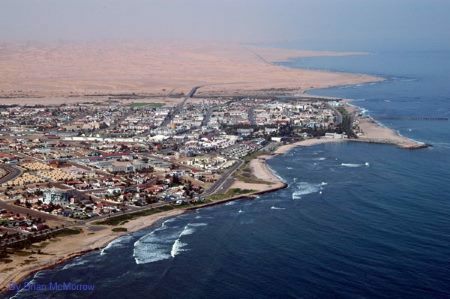 Swakopmund, known as Swakop in Namibia is the country’s biggest coastal resort and adventure town. The city’s German origins are quite pronounced in beautiful old German colonial buildings throughout the city, making an even starker contrast for this town sitting at the edge of the Namib Desert. Just south of Swakop lies the town of Walvis Bay with the highest density of shorebirds in southern Africa, with 13,000 birds of more than 30 species. From Swakop you can also visit the Cape Fur Seals at Cape Cross, see the famous ancient Welwitschia plants, go sand boarding, quad biking, sky diving, parachuting, hot air ballooning, on a micro flight, surfing, hiking and horseback riding. Best time to visit this town for fishing and surfing is from December to February. June and July can be cold with some rain.